I'm back with another post this week and I have to say, this is probably one of my favorite looks to date! There is something about slipping into your best pair of jeans and adding an airy blouse that just screams weekend. It's comfortable, classic, and best of all, you look put-together without looking like you REALLY tried. One way I try to spruce up a casual look is by accessorizing via my favorite accessory - earrings! Honestly, you guys, they can instantly change a whole look! I've been obsessed with earrings, and so I decided to share the top 3 earrings you need this summer! You know what they say, the bigger the hoop, the bigger the... just kidding. Hoop earrings are a classic jewelry staple! They are sophisticated and honestly, there are TONS of different hoop varieties! The moment I say these Cult Gaia earrings (similar here), I knew I had to have them! I waited around until they were on Shopbob and bought them right away. While the blue/periwinkle color is sold out, I am loving these in a salmon pink! Acrylic earrings have been EVERYWHERE this season! They look very ornate and some even are made to look like stones (without the added weight)! I've also been crushing on these Cult Gaia earrings too! What can I say, I love their accessories! Although I love my statement earrings, I also love tiny, dainty jewelry. Especially when I wear over-the-top outfits that have a lot of patterns, I like to minimize the look a bit by complementing it with small earrings. Such big hoop earrings! 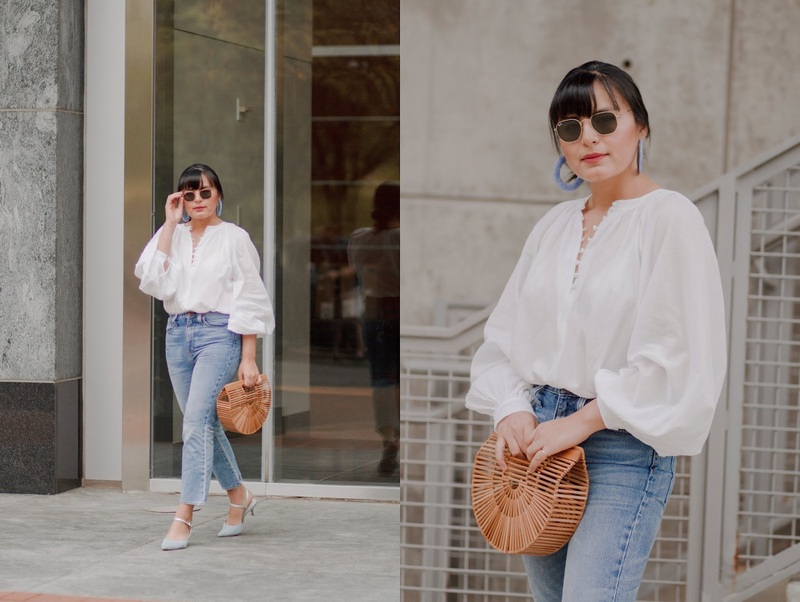 Love the way you wear them by teaming with a white blouse and blue jeans. So sweet, thanks Pamela! I have a thing for big earrings at the moment!